The above quote from 1910 is a fair description of the Alligator. It is a device that combines a letter opener with a check protector. The letter opener is of a design that hasn’t changed in over a century. You can still find this type of letter opener today. The check protector portion is built into the two-piece handle and works by embossing a quilt-type pattern in a rectangle measuring approximately 2″ x .5″. You would write out your check and then emboss over it. This was to discourage trying to make changes to the check after the fact. The Alligator weighs in at 2 ounces and measures 7.5625″ L x .9375″ W. It is made of nickel-plated steel. It is a very high-quality item, extremely durable and well-built. This was patented as a check protector under U.S. patent 826135. The patent was applied for on May 31, 1904 and granted on July 17, 1906 to Silas I. Atwater. It was first advertised in 1904. If you find this item stamped with PAT APPD FOR then you know it was manufactured between 1904 and 1906. Otherwise, they are all stamped PAT’D JULY 17’06. The Alligator was manufactured by S.I. Atwater, later known as S.I. Atwater Specialties Company. 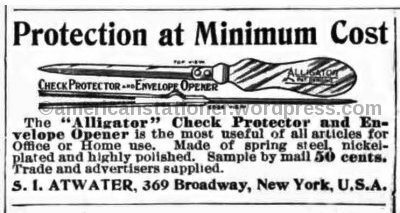 It was available starting in 1904 and the latest reference I can find that specifically mentions the Alligator is in May 1920. However, as a low-cost “novelty” item it never did receive a lot of advertising. It is entirely possible that the Alligator was available after 1920. In the January 1908 issue of the American Stationer it is mentioned that Hampden Hoge of the Hoge Specialty Co “has taken over the entire line of stationery specialties formerly manufactured and controlled by S.I. Atwater”. As S.I. Atwater is the only company ever mentioned in ads it sounds like S.I. Atwater simply became a subsidiary company under the Hoge Specialty Co.